The simple elegant design of the popular collection has been given a vibrant pop of colour! 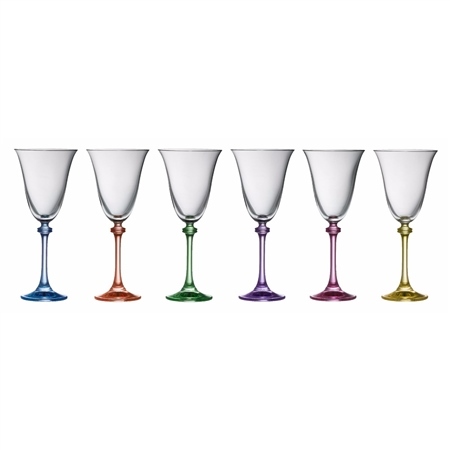 Impress your guests with these charming crystal goblets featuring vibrant coloured stems, the perfect way to add a splash of colour to your party. •Ideal for Parties and BBqs. This was bought as a gift for my wife and she absolutely loved them! Extremely happy with glasses they are beautiful. Arrived quickly and very well packed. Are these glasses used for wine? Or water? Are they crystal? Thank you. (Galway Living Liberty Paety Goblets)! Is the color a glaze? Or is the color throughout the glass itself? Are these made in Ireland or just designed there? Thank you!